Over the past year, the GIS division of the Information Technology department received two awards related to their contributions to disaster response/recovering during and in the aftermath of the 2015 flooding event. Each year the South Carolina Association of Counties (SCAC) grants the J. Mitchell Graham Award to counties that demonstrate innovation in projects that are designed and implemented to meet community needs. Richland County IT/GIS was recognized for the development and publication of geospatial resources to assist with 2015 flood disaster response/recovery. To help respond to the declared Natural Disaster in Richland County, the county GIS team has worked with numerous partners to provide recovery and assessment support. As part of that effort, several geospatial tools have been developed and are available (below) for use by local authorities for coordination efforts and to the public for information. We thank our corporate friends at Woolpert and Google for their support. From their Dayton, Ohio headquarters, Woolpert, Inc. flew 1 foot aerial imagery the afternoon of Tuesday, October 6, 2015 to assist in delineating the geographic extent of the flooding. 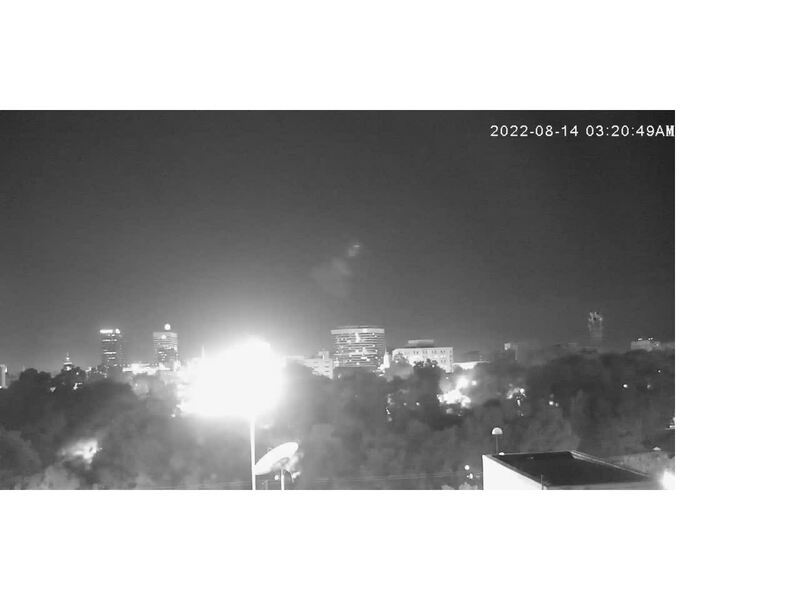 The imagery was collected over much of the City of Columbia and Forest Acres areas. 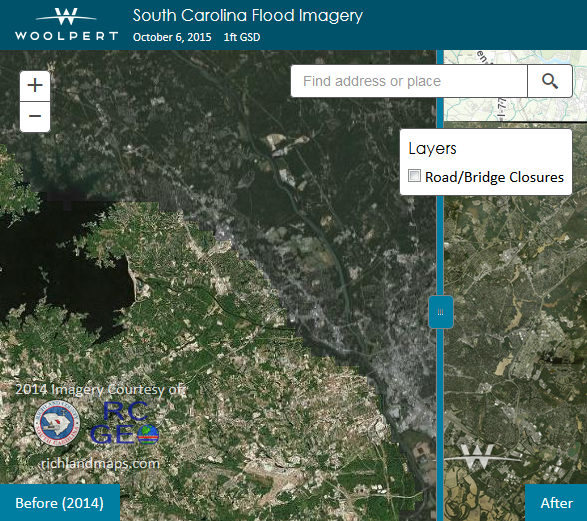 Woolpert then created a ‘Before/After’ web application to compared imagery and assess damage. 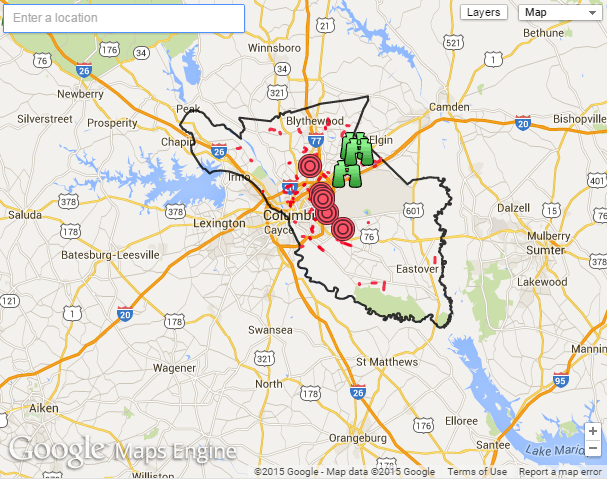 Richland County GIS provided imagery resources with assistance from Google. The Richland County GIS team assembled an online assessment tool to assist County departments in their efforts to record and analyze flooding impact. The application is built on open source technology and includes imagery from the County’s Google contract and from flood imagery collected by Woolpert. This tool will be an evolving application as the weeks of recovery and assessment progress. NOTE - The Road and Dam Status Viewer is no longer available for use; Google has discontinued the use of this technology. 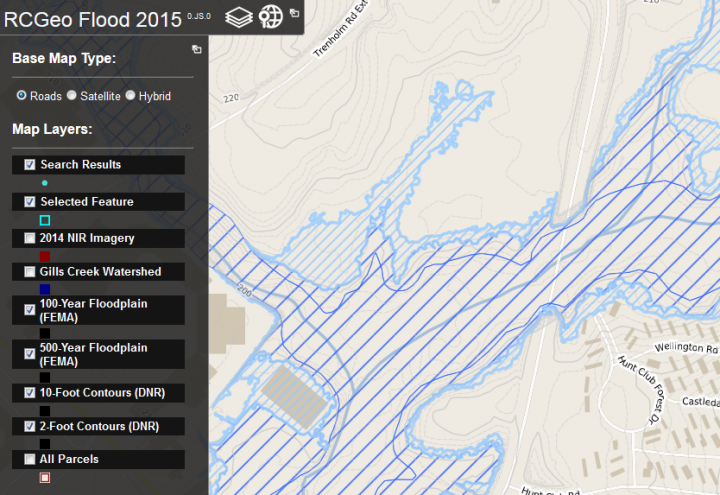 Please see the RC GEO Flood Viewer to view our most recent information. Richland County has been leveraging automated vehicle location technologies to help manage its fleet of approximately 200 non-emergency vehicles since 2003 with the implementation of a home-grown VHF radio network and GPS tracking technologies. Since then, AVL solutions have matured significantly, allowing for consumer-centric cloud hosted software as a service (SAAS) platforms to become the norm. Richland County is in the process of transitioning its AVL system to a new cellular based SAAS solution which utilizes inexpensive standard ODBII hardware. This will continue to provide management with the ability to monitor county assets and view historical data. Additional functionality includes both real-time vehicle activity alerts and application access from any web-accessible device. It is hoped that this transition will begin in the coming months and come to completion in the Fall of 2015. The evolution of GIS and web technologies continues to move at a breakneck pace. Every change made by large technology corporations impacts millions of users worldwide. Technologies get developed and promoted then fall out of favor (eliminated/deprecated) for new technologies. The most unfortunate part of that cycle is practitioners who are tasked with providing services are squeezed to support users. Displaying mapped data online is one of those sectors that has been greatly impacted by defacto standards being superseded by new technologies. SCDNR has updated 2010 lines available for download provided that you have the appropriate software. There are many sources where you can obtain Free and Open Source (FOSS) desktop GIS packages. See this link to view a forum discussion that lists many options and provides some user feedback about their experiences using this software. Geocoding is the process of translating written addresses to physical locations on a map. Geocode your tabular address records using resources available to you through your Google account. Click Here to view instructions for getting started with this free geocoding service. Which IT/GIS web mapping application is your favorite?